Hi, I’m Laura and I never thought I would be a professional calligrapher. I have probably always been a bit artistic but I didn’t really plan on growing up to be an artist so I never gave it much thought. I always had great handwriting though and was overly proud of it. I got a calligraphy set for Christmas when I was 13 or 14 years old and realized it was pretty addicting (and I was pretty terrible at it). Fast forward and I decided to become an art teacher and went to art school, learned to paint and draw and got decent at it, and continued to do calligraphy as a sort-of hobby. I married my high school sweetheart in 2013, graduated college in 2014, and started my first teaching job after graduation. I was actually hired as a special education teacher (my minor) at a high school, and I loved that job but definitely missed the creative outlet. I started an Etsy shop during my first year of teaching and did my first few wedding envelope jobs during those two years. 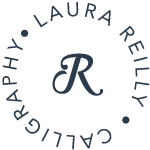 When I had my first baby in July 2016 I decided not to return to teaching and took a leap of faith in starting Laura Reilly Calligraphy for reals. I have to give major props to my husband for supporting and encouraging that decision and the two crazy years since then. We had another baby in 2018 and so my days are a giant ball of sweet babies and client projects and all of the things that come along with being a wife, mom, and small business owner. I’m made of ice cream and coffee (equal parts) and I wish I liked to run (I don’t). I still love teaching and try to teach classes and workshops any chance I get, but I’m also a giant homebody and love to run home to binge on British tv shows with babies crawling on me (though let’s face it we usually end up watching Super Why because toddlers). So there you have it, the story of me and this biz in a nutshell! Thanks for stopping by my corner of the internet!